Cezanne Classic Smoothing Treatment works from the inside out to strengthen and fortify your hair while softening and lengthening your curls. 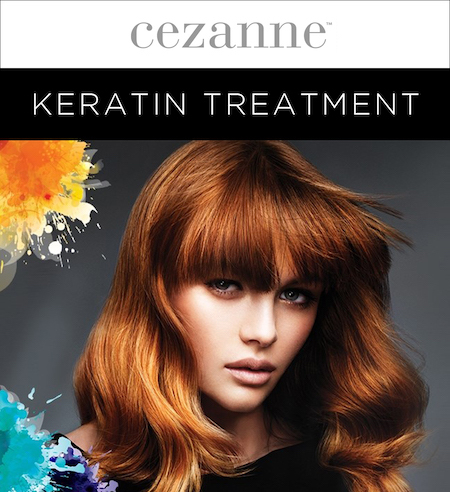 Gentle enough to use on all hair types, including colour treated hair, Cezanne is made with a signature blend of premium keratin proteins, botanical extracts and vitamins, and contains no formaldehyde or other toxic ingredients. Your hair can be washed or coloured immediately after the treatment. Your hair will be easier and quicker to dry and style and, unlike other formaldehyde-based smoothing systems, Cezanne will still allow your hair to hold a curl from a curling iron. Can it be used on all hair types? Yes, the treatment can be used on any hair type and texture, no matter how coloured, bleached, highlighted or damaged. It can even be used over other chemical treatments such as straighteners and relaxers. How long with the keratin treatment last? The treatment will last for months. The amount of time will vary depending on hair type, hair texture and your maintenance routine.